About me and my life ...: Fedora 28 : Create a ISO image with stage2 and kernel ELF . Fedora 28 : Create a ISO image with stage2 and kernel ELF . The tutorial for today solves the problem of creating an ISO image. 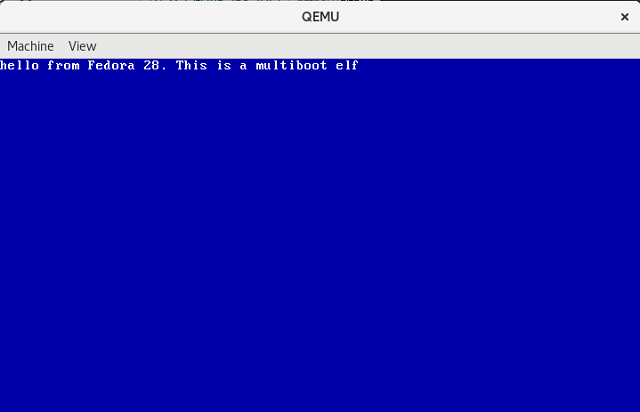 This image can be run and test with QEMU tool emulator like any ISO CDROM image. You can build your kernel with any assembler and use this steps to test it. You need a stage2 file known like: stage2_eltorito. This file uses the El Torito is a specification for bootable CD using BIOS functions. The GRUB supports the no emulation mode in the El Torito specification. El Torito file booting begins by the Boot Record of the ISO 9660 filesystem at block address 0x11. You can get this file from your Linux distro of you can find installed into old GRUB.